It’s not a new problem. I first started having problems this Summer. I like to prepare for meetings in advance, so I spent some time jotting down notes in Evernote in the evening. I was a bit of a hurry to get to the meeting the next morning, so I didn’t bother to press the Sync button on Evernote on my iMac. I’ve always had automatic syncing on, so I didn’t really think twice about it. Except I should have. On the bus I took out my iPhone to revise the agenda for the meeting. Tough luck. The note isn’t there, and neither are all the other notes I knew I created the day before, even a couple of days before! Of course, I have no way to remotely push the Evernote Sync button on my iMac, so I improvise and try to recreate the notes from memory. Luckily I hadn’t yet completely outsourced my memory to Evernote despite being a Premium user, so I was able to remember most of it. 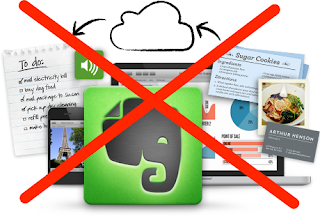 Do elephants run Evernote support? The first thing I did when I got back home was to check my Evernote settings. Everything was as it should had been, automatic sync every 5 minutes. I try to manually sync, and the notes then appear on my iPhone. Ok, time to contact Evernote support. As a Premium user I did get a response within the business day, but I can’t say it was very useful. I sent them the activity log and they recommended reinstalling Evernote. No other explanation. Was this a recurring problem? Just a faulty installation? How can I check that the next time? I suggested they implement a sync checker into the app that would actually tell the user automatic syncing has failed. I don’t know about you, but I don’t really have a habit of checking apps logs when I except the app to just work. In fact, I didn’t even know Evernote had an Activity Log before I ran into problems. Back to my story. Time goes by. I replace my iMac with a MacBook Pro and spend most of the time on the same machine. Meaning, I’m mostly using Evernote on one device. I still like the idea of being able to access notes from anywhere if I need to. However, the few times I do use the Evernote mobile apps, they display weird sync behavior. I don’t pay much attention to the issue as I now always have my laptop with me during meetings. So I decide to stick with Evernote for the time being and renew my subscription on December 1. As an Evernote user, I’m glad to see them release a big update to all their apps this Fall. The mobile one certainly has some nice tricks up its sleeve, like the sync button that’s now easily accessible on the first screen (yep, that wasn’t the case before). The Mac app is bloated and takes some time getting used to, but at least I can still access my notes and write them as before. Changes happen, so I don’t make a big deal out of this. Until yesterday, when I decide to only take my iPad to work. And guess what? I want to look up something in Evernote and notice that all notes from over a week ago are missing. I press the sync button over and over again, on my iPad, on my iPhone. Nope. The notes just aren’t in the cloud. And that is where my patience ends. Are regular reinstalls the only way to make Evernote sync? I contact support again, specifically asking them not to serve me with an automated reply like last time. I want to talk to a human that can actually explain what’s going one. But no, no such luck. Either they have machines answering the tickets or their support staff has very strict guidelines on what they can and cannot write. Meanwhile I’ve had very good experience with Nike Store support, you can see they are actual humans working there. You know, with emotions and the ability to write unique sentences. Anyhow, the official Evernote answer is that I appear to be running an old version of the app (after sending the ticket the latest update showed up in the Mac App Store) and that I should reinstall Evernote. Same reply I got last time, same instruction on how to reinstall the app (as if that was so difficult on a Mac…), yet they still haven’t figured out Evernote now lives in the Mac App Store. Dear Evernote, I just don’t want to talk to support bots anymore. I don’t need a bloated app that looks pretty. I want to write notes and have them in sync on all my devices. Which is why I cancelled my Evernote Premium subscription yesterday and started looking for alternatives. I looked at Springpad - but they have no Mac client. I looked at Simplenote - but apparently they’ve been having sync issues for a while now as well. And the more I looked, the more I started seeing Dropbox mentioned as an alternative! Dropbox? Yeah, you can easily have a folder for Notes, keep them in .txt or .rtf format and edit them practically anywhere. In TextEdit, for instance, which is one of the Apple apps I use most often on my Mac. And as I started considering this alternative, I started discovering more and more note taking apps that can sync with Dropbox, even iCloud. Sure, they don’t have all the fancy stuff Evernote has, but I rarely use tags after I assign them, and I’ve only needed audio notes once in the last year. Most of my notes are text notes. I already use Pinterest for visual bookmarking, and Springpad seems like a really nice complementary service for that. It has a great mobile app and it’s very easy to have a private collection of more visually based notes and share them with my husband. For free! So, I realize that instead of a full blown alternative to Evernote what I really need is a bloat-free app that enables me to write, has just a few of the basic formatting options (bold, italic, the ability to make links). And this is where I discover iA Writer. Well, discover is not really the right word here. I was aware of the app before, but I thought it was just for fancy writing stuff, a more simple version of Pages. But it turns out it now has both iCloud and Dropbox sync, a gorgeously simple native Mac app and an equally simple iOS client that works for both iPhone and iPad. The runner up was Byword, another simple text editor both for Macs and iOS devices. Both of these apps focus on writing text in an uncluttered way, and both support Markdown for basic text formatting. And oh, they also make it easier to prepare text for the web, HTML tags and all. Bingo! Yeah, I know, I’m quite biased. All the gadgets I use were designed by Apple in California (and Assembled in China, of course), so I didn’t blink twice because there’s no Android or Windows support in either of these apps. However! I did manage to export all my notes from Evernote to Dropbox using cloudHQ in .txt format, which means I can access and edit them anywhere. And while I’ll be using iCloud in iA Writer for notes I am using the most (offline ability tipped the scale), I’ll keep using Dropbox as a storage/backup tool for less frequently used notes. Spotlight will make sure I can easily find old notes in the Notes folder on my Dropbox. Sure, the solution might not be as elegant as using Evernote for everything, but iCloud and Dropbox syncing has so far been good to me. And I can use the 40€/year I’ll be saving for not using Evernote anymore on expanded iCloud storage if I need to (as a legacy MobileMe member I still have more than enough space, but expanding storage might come in handy if I start using iCloud more intensively in various apps). TL;DR: Evernote, make sure your core functionality works before focusing on the looks! And with that, dear Evernote, I am saying my official goodbyes. I have fond memories of you, we’ve had some good times together. But I just can’t watch anymore as your apps get prettier and prettier and your core functionality lies forgotten in the dust. A quick Google search showed I’m not the only one with this problem. And I’m just not willing to reinstall your app once in a while to make sure it works properly. I’m not playing the Evernote lottery (“Will my notes be synced today?”) anymore. Mind you, I’m not complaining about a free service here, I’m complaining about a service I pay for and it’s just not working as advertised. Goodbye, Evernote. I am moving on, to more simple (and cheaper) solutions. I’ll just make sure all notes were migrated properly and then I’ll gladly uninstall your app from my Mac, as per your instructions, permanently. Update: Well, one thing Evernote support did right was to refund my account for the yearly subscription. Thanks, I guess, though I would rather have a functional product I was more than happy to pay for.